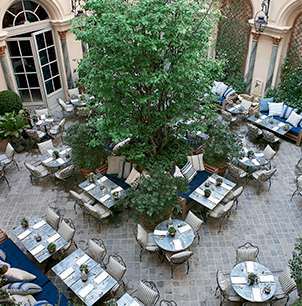 I want it to be the best restaurant of its kind in Paris, offering great American food in the most beautiful and romantic setting. It has gracious hospitality with a glamorous yet informal sophistication. The careful mix of vintage and modern fabrics and the juxtaposition of weathered teak and wrought iron crafts a sophisticated, rustic charm in the courtyard. Large banquettes are adorned with blue and white pillows and cushions to seat 70 guests in comfort. The transfixing sound of flowing water from the horse fountain lends further serenity within the bustling city. Sturdy wood beams, worn leather, and unfinished limestone conjure a lived-in comfort in the 48-seat main dining room. A vast countryside landscape painting adorns the fireplace mantle, and saddle racks and vintage horse blankets enhance the tasteful equestrian atmosphere. The perfect mix of classic American 1940s and Big Band–era music deliberately varies throughout the day and evening. The variety of iron sconces, tea light votives, and substantial hurricanes makes for romantic dining. Further, a subtle change in tabletop settings and linens for each meal demonstrates Ralph’s dedication to making every guest’s experience unique. An American version of American food, the flavors of Ralph’s are a testament to the infinitely rich and varied land that produced them. 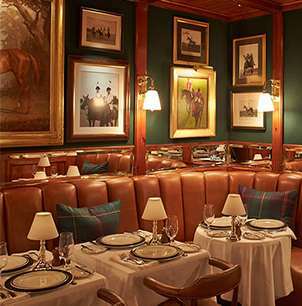 The menu is crafted from Ralph Lauren’s personal choices, with an appreciation for diverse palettes. Lobster, Maryland-style crab cake, specialty burgers, and Black Angus beef enhance the incredible authenticity of the dining experience. 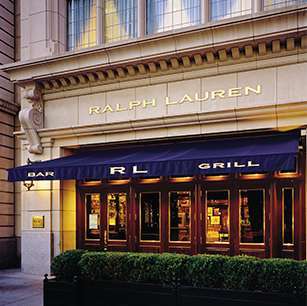 The succulent tenderloin and strip steaks are products of Ralph Lauren’s own Double RL Ranch in Colorado. Classic cocktails of the Western world are expertly mixed behind the bar. 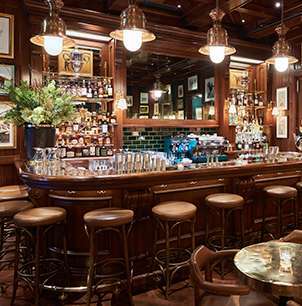 Versions of mint juleps, whiskey sours, and Ralph Lauren’s favourite margarita perfectly complement the rich but simplistic American cuisine. The finest American and French wines are thoughtfully selected to stimulate the palate and complete an idyllic dining experience.